The first step in screen door installation is usually the actual screen door removal. This page will give you basic screen door installation and replacement techniques for the four most common patio screen doors that the homeowner is likely to run into. Read these carefully, in some types of screen door you can damage the patio door if the sliding screen door replacement is not done properly. You might run into types of doors than are not described here. If you need specific information about your sliding screendoor installation, don’t hesitate to send me a message using the contact form at the bottom of this page. These are the simplest types of screendoor installation and removal. Here the screen door is on the outside and is easy to get at. 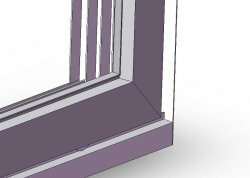 More than likely, the screendoor will have two rollers or plastic glides at the bottom and two at the top which will have to be loosened so that they do not break when the door is removed. 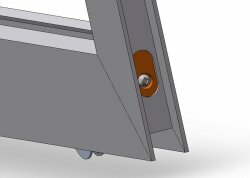 Usually there is some kind of adjustment screw at the edges of the door or sticking up above the roller as in the pictures on the left hand side. Loosen the adjustment screw until the roller moves in and the door becomes easier to move up and down. If the screws are rusty, spraying them with WD40 or penetrating oil and waiting a few minutes may help loosen them. If that does not work, figure on getting new rollers. Lift the screendoor up slightly, you should see the bottom rollers or wheels just poking out the bottom of the screendoor. Just like they are in the pictures. Take a flat blade screwdriver and slide it under the spring loaded rollers and gently lift them up. Carefully pry the bottom edge of the door and the roller out over top of the screendoor track where the rollers glide. Lift the entire screen door frame up and out of the bottom screendoor track. Once you have the screen out, check the rollers to make sure all of the rollers roll easily and adjust properly. Some screendoor rollers require that the frame taken apart before they can be removed. Better to know that now than after you have completed your installation job. To reinstall the screen do all of the above steps in reverse order. Start by installing the doorpanel more or less in the center of the patio doorframe. Get the rollers on top of the screen onto their track. Hold the doorpanel steady so the rollers stay engaged in the top. Then push the bottom of the door back to the vertical position and onto the bottom track. Dont force the bottom rollers on to the bottom track. Use a flat screwdriver to gently pry them over and onto their track. Then adjust the rollers to raise the door. 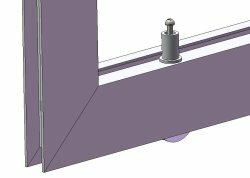 Adjust the rollers until the vertical bar with the handle is perfectly parallel to the vertical patio doorjamb on the lock side. With the door reinstalled, screw in the adjustment screws until each roller just touches the track. Usually 1/8” is all that’s needed. Adjust both bottom rollers so that it closes squarely in the frame. Adjust the lock if there is one. You may need to adjust the position of the lock hasp to get the lock to function again. You should notice a huge difference in how easy it is to operate the door. There should not be any rubbing noises. With good ball bearing rollers, the wind should be able to blow your patioscreen open. The information presented here should cover most types of sliding screening installation and removal. If you run across different, please contact me. I will try to offer whatever assistance I can. If you are in a situation where the sliding screen needs to be replaced, I can ship you a new screen kit that you can easily put together. Fill in the form below with all the details about your doors. Need more help with screen door installation or removal ? Many people have written into all-about-screen-doors looking for help. I have put together this screen door install and repair comments page summarizing them. Lots more pictures and suggestions there for all types of screen doors.